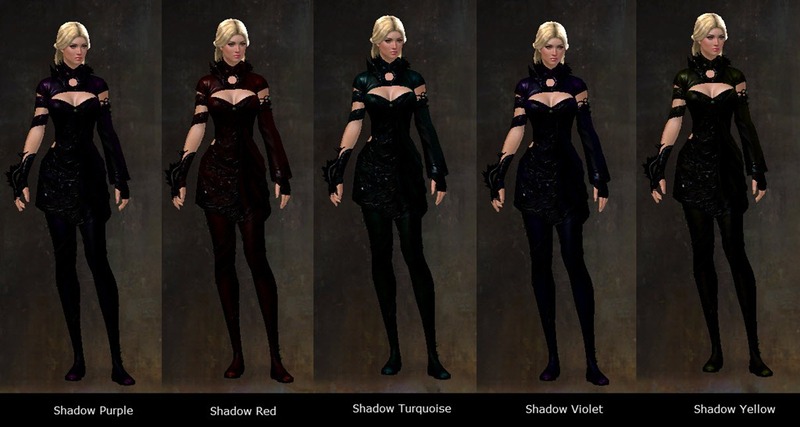 Shadow Dyes that was added with yesterday’s patch are now available in the gemstore. 125 gems each, 5 for 500 gems, or 25 for 2500 gems. Each dye kit draws a pool of 25 random colors, with 10 of them being the exclusive shadow dyes. Midnight Ice is the best black dye; dunno why people like Abyss, its way lighter. I feel like Midnight Ice looks slightly blue when you cover yourself with it. I’d just use it as a minor color with a golden dye covering the most of my armor. It looks slightly blue on some textures, jet black on others. But Shadow Abyss looks jet black on EVERYTHING. Midnight Ice used to be the best black dye 😛 Shadow abyss wins now. Haha dat Shadow Abyss, omg! It’s…it’s a black blob! They all look nice! I don’t usually buy dye packs, but I’ll roll the dice on a few of these, maybe get Green, Blue, Violet, or Abyss. shadow abyss already one of the top 5 most expensive. nice. i brought 50 dye pack and got 1. considering keeping it since its darker than dark and i have almost all the dye. i also want to see these dyes on lumienscenes armor… i know with juggernaut.. they just look like… dark metal. they look awful on lumi armour, don’t bother. They all look identical to just putting plain abyss on it. oh, good, well i guess they can be used for everything else buy my soon to be obtained lumi gear. Ugh! I want them all! My wallet hurts. I need to farm gold ASAP! The normal Abyss should get lower in price now? I can just imagine the demand for Shadow Abyss. It’s permanent. The price is just gonna go down. They’re not time limited. They will always be in the gem store so the price will only go down from here on out. The Shadow Magenta is so close to the Shadow Abyss, I bought a few at a fraction of the price. Shadow Yellow is perfect for a Necro. You coulda bought 2 of them for the price of that many gems. =/ Why bother with RNG? It’s not designed to give you what you want. i got 2, (all 8 actually and 5 of the red ones and almost 2-3 of every one but i opened 50 packs) sell the other ones you got to buy the one you want. easy. It’s more accurate in preview. In action… they barely look any different. I cannot distinguish shadow blue and shadow abyss. Personally, I prefer Midnight Ice and Shadow Blue to the straight Abyss and Shadow Abyss. The blue highlights look better on both armour and material, and the colours are so dark that they don’t clash with brighter accent colours you may wish to use (red, gold, orange). so abyss was already slightly darker black, now shadow abyss is more then slightly darker black? Abyss is more like a darker shade of grey. Shadow Abyss looks jet black to me. Yeah shadow Abyss looks jet black to me too! Soooo I bought two dye kits with some leftover gems… and got two blue 1s50c dyes. GG. I wasted 500 gems on this garbage. Got about 20 silver worth of dyes. I splurged and bought 3×5 dyes. I got shadow green, turquoise, purple, violet and abyss. Not bad. I would say that that is far beyond the normal RNG for me. Were you not playing the game for a while then just logged back in? I’ve notice RNG gods favor the ones who do not take a shot at it. You also believe in Astrology right? Shadow Abyss is now the blackest black dye in the game.